Windermere’s local economist, Matthew Gardner, does a great job of monitoring and reporting on the economic health, trends and real estate related information in our region and breaking out specific areas too. See the info link below for the latest updates. Our region continues to experience record job and population growth, leading the country for the past full year. While it has created many issues in finding homes to rent or buy, it has also helped create great wealth for those of us currently owning a home and/or investment properties in the region. It seems likely we’ll have another reasonably strong year for market activity but not with the degree of appreciation we’ve seen for the past 2 years. While some property types and homes have had 35% + appreciation over the past 2 years, the prognosis is for only 5-8% appreciation in 2018. This could mean the first half of 2018 will be the last opportunity to sell in to a strong market. I’m not expecting prices to fall in any near term basis but we’ve been seeing price flatten for most of the area since June and the spring will likely be the last spike up in pricing. If you want to capture this, it may be time to work on your home projects and be ready to come on the market by February to get the best exposure and strength of market conditions to work in your favor. 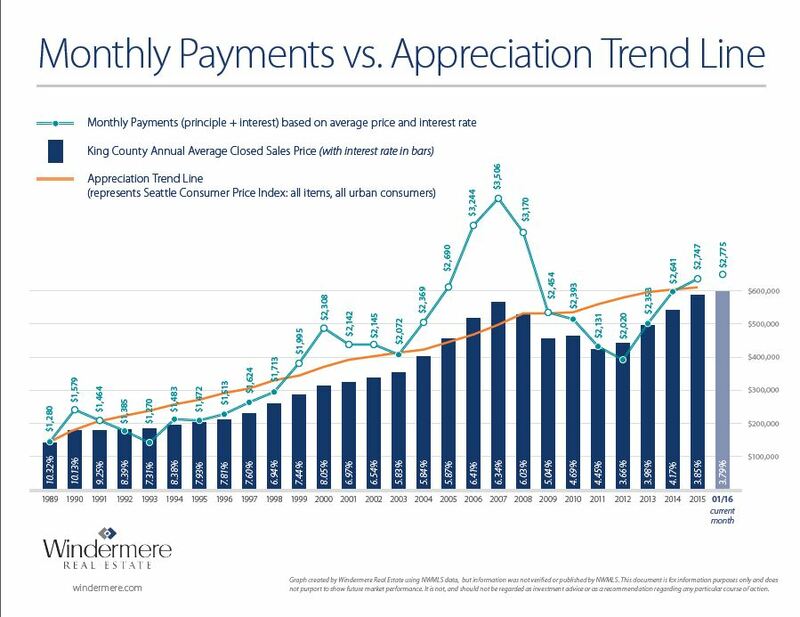 Buyers will likely find continuing upward pressure on interest rates but will also find prices leveling off as the summer arrives. At least that’s what my crystal bald head seems to be seeing. Let me know if I can help you with any planning or specific market conditions affecting you. Home Values, Can you believe ……? Every week, often daily, I’m asked, “Paul, can you believe how much ……, home prices are rising, over asking price bids are climbing too, quantity of people came thru an open house, submitted offers on a home……. On and on it goes. The simple and short answer is “No, I cant believe it.” I can rationalize it, but in many cases I can’t support the rises. They are just too crazy to believe. But is it real and can “it” continue—it appears so. Pricing is always a matter of supply and demand and we are in a time of exceptional demand. Rents are continuing to rise and we are seeing 1,000+ people a week moving in to the central Puget Sound area of Seattle and the Eastside. With interest rates still in the excellent range of just over 4%, it’s easy to see why people want to buy vs. rent. People who have been renting want to buy. People who lost their homes in the recession want to buy. Seniors aren’t leaving the area like they did 10 & 20 years ago when they retired, so they want to sell and buy. Millennials are buying and all kinds of “lateral” buyers want to sell and buy–changing locations, shortening commutes, increasing or decreasing their home sizes in their current areas, etc. These are all huge buyer groups and they all want to buy. We aren’t even talking about the investor buyers, who, as most agents and active buyers in the market see, are out shopping and buying in huge quantities. So when will we find homes for all these people? It is doubtful to be any time soon. Builders are building as fast as they can but often not in areas where more buyers want to be. Those that are willing to accept longer commutes can find options but in the overall, still at very low overall availability. Prices on new construction homes in the major urban areas can be found but not commonly under the $1M mark. We are rapidly pricing many buyers out of the market and this may lead to some exodus or reduction in the quantity of people moving here. Still with our region being home to Amazon, Microsoft, Google, Boeing, Costco, Expedia and a myriad of technology, medical research and Bio-tech companies, it’s not realistic to think this inward flow will be stalling out too soon. This means that home prices should continue to rise over the next several years. Will there be a top? Undoubtedly. When and where is only a guess for anyone. Some analysts point to expected business cycle patterns to say 2018 will see a slow down but that’s a relative term, slow down. With our region now topping the highest home value appreciation for 6 straight months, what will a slow down really mean? Rents are among the highest in the world, and still rising at some of the fastest paces; so what does a slow down really mean. What I see is a major shift in the Seattle area home values that isn’t a bubble, but a giant ballooning expansion. Yes, the expansion will decline at some point; yes we could have some home values be somewhat in a bubble, but the general economic factors for these home values to stay up are much more likely than we’ve ever had in this region. Geo-political events can affect us; certainly; but this gigantic increase in our population seems likely to keep our housing in high demand for the foreseeable future, even if ripples appear that create some breaks in the speed. What does this mean for you? If you are a home owner, your home has never been worth more than it is today. It will likely continue to rise in value over the coming years. If you are thinking about selling, you are in the strongest possible negotiation position. If selling and leaving the area is in your “near future” plans, you may want to expedite those plans to capture this market. Yes, your home is likely worth more next year, but you may not want to tempt a ripple in the market that may cause a short term stop to your prized position. If you are a buyer, be diligent and vigilant. Find ways to get any extra monies you can so you can be in the strongest possible position for a buyer in this market. Don’t be timid about stretching on a house–paying $465K for a house listed at $435K may seem nuts but with home prices rising 10, 15, 20% in many cases over the last year and expected to be around 10% this year, getting the home you want, at a price you can afford should be “the” critical factor, not what price you paid vs. what the seller might have been asking. Obviously there are limits but a good agent can help you establish those. The point is your frame of reference and focus needs to be on your ability to find and buy what you want. The rising values will soon reward you for your boldness. The frenetic pace of the real estate market continues to frustrate home Buyers while rewarding home Sellers. The data shows 13% appreciation on the eastside from last year but for those of us on the streets and in the negotiations, it's not abnormal to see prices up 20% since the beginning of this year. Bidding on homes seems to have little basis on comparable values or sales data and much more to do with capturing that home, regardless of price. Business practices are challenging and changing constantly; trying to figure out if or when to delay reviewing offers; how to make counter offers; what demands Sellers can make on Buyers and what incentives Buyers can create to have their offer selected by Sellers.The pace and frustrations are dizzying. Eastside prices are at all time highs, at just under $783,000 up 13% from 2015. Seeking affordability, Buyers have driven up the median price on condos to $345,608; that's 15% above last year at this time. 73% of homes are selling at or above asking price with an average market time of 6 days; a timeline created by Sellers and agents delaying the review of offers to allow more buyers to view the home and generate more offers. While the average and median over asking prices are only 5.13 and 3.75% respectively, anyone actively in the market knows these figures are quite often in the 15-20+% range over asking price. A staggering statistic is that sales of $3M+ homes is up 94% over 2015; not surprisingly this is drawing more sellers and inventory has jumped 31% for homes for sale in this price range. I'd be cautious if I were a Buyer in this range as there just aren't that many folks with incomes to support future purchases in this price range. This could be a great time to be a Seller for homes in this range, while there is still optimism by Buyers. Beware though, the increased inventory can mean a decline in leverage for home Sellers in this price range relative to lower price range Sellers. Seattle's statistics are just as bullish for home Sellers with price up 19%, to just about $637,500 and again condo sales and prices are rising for those seeking close in affordability. Median condo prices are just over $400K, up 21% from 2015. Sales in the high end markets, $1-3M are up 25-36%, while inventories are declining 17-33%. The high end has lower overall price points than the Eastside but shows a very strong market in both areas, especially for homes under $2M. What's driving this strength of market and how long will it last are constant questions I receive. Job and population growth as well as near record low interest rates are the main reasons for the why; as well as younger buyers entering the market and people who lost their homes to foreclosure or bankruptcy in the market turn down returning to buy. Rising rental rates are also forcing many to seek stability of their housing costs. Average house payments are a lower percentage of incomes for most buyers than rental rates. So why not own if you can find a home you like and pay less to own it that rent it. How long this lasts? This is always the $64M question. Some economists predict our region could see this strength continue to 2021; not to the degree of the last year but still 4-5% per year as our local economy continues to thrive and our population grows. Until we see more folks retiring and leaving their homes and/or the area, something that was postponed by many with the economic downturn, This should increase home inventories and likely lessen local demand but we need a lot of inventory to make that happen and I don't see that happening too soon. New construction is increasing but much more so in the suburbs and further out ex-urbs; still in-fill lots and small subdivisions are increasing. Any inventory increase is welcome. So, if you're a home Seller, it may be time to capitalize on near peak values. While the market may continue upward, the bulk of gains may be had and uncertain economic conditions could reverse this quickly. If you're home Buyer, stay vigilant and diligent. Hopefully the typical July to August slow down in sales will come back for this year, along with modest gains in selection and help you find your new home. 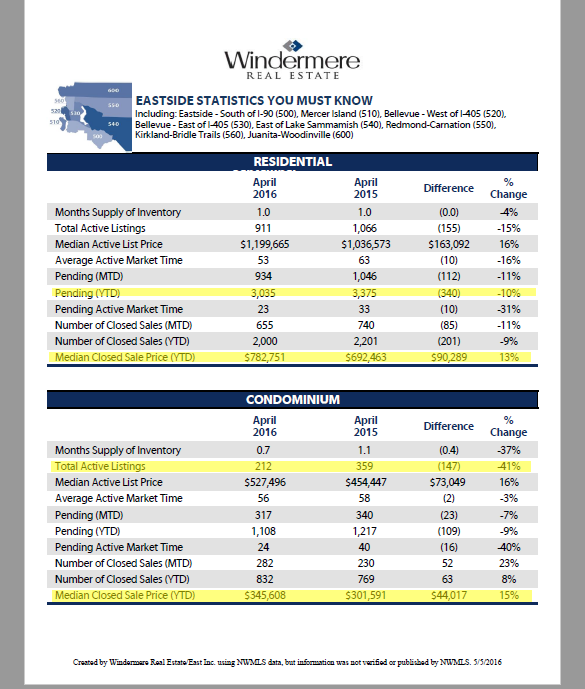 Enjoy this report from Windermere's Chief Economist, Matthew Gardner, on economic and real estate changes. If you don't see the hyper link, hover on "this report" above to go to full report. The main takeaways to me are that our dramatic decline in available homes for sale in the King & Snohomish areas are finally showing declines in sales. Not surprisingly, this is putting more upward pressure on prices with King County up 13.6% from Q1 2015 and 10.7% in Snohomish County. In some neigbhorhoods and price ranges prices are up almost this much from Q4 2015. Continued job growth and inbound migration are the major driving forces for the demand on housing; something that will continue with more renters coming back into the buying market. Rental rates are seeing a slow diwb in increases but are still on the upswing, especially for 2+ bedroom options and closer-in areas. Near record low interest rates are also driving demand as buyers try to capture the 3.5-3.75% rates avaiable for 30 year mortgages and even less for 15 Year or adjustable rate programs. Bottom line: home sellers are doing very well on selling their homes but should obtain advice on selecting the best offers to close successfully. Buyers are needing better guidance on how to structure and present their offers but also need to plan for patience and frustratsion as multiple offer situations are the norm and with 12-25+ offers for any home for sale, even very good offers are struggling to succeed in the current market. Economists and financial forecasters have been telling us to expect interest rates to rise for the past 5 years or more, yet rates resisted. Now they have dropped back down to a 3.625% range for 30 year fixed rate mortgages; even for jumbo loan amounts–loans above a $417,000 amount, that typically aren't bought or secured by government entities like Fannie Mae and Freddie Mac. The rates get even lower for 15 year mortgages, now closer to a 3% rate. This can be a great opportunity for those wanting to buy a home. Most of 2015 saw rates bouncing between 3.75 and 4.125%. The payment differential between our current rates and what you may have could be a $60-85+/month in savings. This also means that those of you who bought a home a few years ago and possibly were required to pay for mortgage insurance can now consider refinancing your loan and remove this mortgage insurance premium while possibly lowering your interest rate too. Two ways to help lower house payment. Since much of our area has seen 9-15% appreciation, just in 2015, and similar rises in 2014 values, many of us have greater home equity than we anticipated. A 20% equity is required to remove mortgage insurance in most cases. If you still like your home there is no reason to sell it but you may want to consider refinancing it to remove this insurance premium or lower your payment or switch to a shorter term mortgage to help pay off your home sooner. .
One other consideration while rates are low may be to refinance your home and pull out some equity in your home to pay off other debts. I'm not a big fan of using our homes as a piggy bank but interest rates on credit cards, cars and other large purchases have been rising and those interest payments aren't tax deductible. Your home's interest rate is deductible, in most cases, and often at substantially lower rates than our other debts carry. As always, a conversation about your long term goals, needs and circumstances is wise to see what the best steps for you may be, but our homes are now back to, at or above their peak values and this can help you solve some financial planning issues. If you are thinking you'd sell your home in the near future, refinancing may not make sense; but it is possible to do a no-cost refinance and while you won't get the lowest rates of today, you'd likely be at a 4-4.25% rate. That is still a very attractive figure and can help you reach other financial goals while not adding to your loan balance. There is lots of talk about interest rates rising this year and I'd say it's stil likely they do, but for now, the rest of the world's major economies are struggling more so than the U.S. and this has meant large institutional lenders around the wrold are buying U.S. mortgage backed securities as a safe haven for their monies until the world's ecoomies reach calmer levels. I'm not expecting this to happen too soon, so it's likely rates stay in a narow range around 4% most of this year, with some dips, like we're seeing right now, presenting themselves to all of us as savings opportunities. Let me know if you'd like a recommendation for a good lender or to talk more about your specific circumstances. I'd be happy to help. The information age is changing the speed and style of our communications; this can be seen in all phases of our lives but has unique negative implications in the real estate market. Obviously everyone wants to have information available to them and real estate information is wide open for anyone to find. Buyers can find homes for sale now in hundreds of places and websites. I don't think this has necessarily been a good change as many of the website's information is out of date or otherwise inaccurate and that's frustrating. As an agent, I really can't control everywhere my information may show up nor if or when any site that may skim my information will ever bother to update it. I'm sure we would all be better served with fewer websites but more reliable ones. Equally frustrating is the notion, mostly by home buyers, that they should be able to contact any agent at any time and get an instant call back from that agent. This would be less frustrating if the same buyers would have an open conversation about their information, but that's not what they want. I certainly understand that it should be and likely is possible for you to know a home's size, age, bed/bath count or school district information without having to talk to every agent that has a home for sale that you're interested; but you can learn all of this information and more about any home and only have to talk with one agent; if you have a good agent to help you. I can alleviate a lot of your frustration and save you a lot of time too. For home buyers in particular, an upfront conversation with a quality agent is priceless and critical. You may think you know what you want but having someone ask you some relevant questions about the Why behind your wants can help you and the agent focus on what really does matter to you. It should also help you learn the true market conditions for any given area or price range. In many parts of our region and around the country it's common to say "it's a sellers market" but this is rarely universally true. There are almost always holes in the "norm" of a market. The Puget Sound area had a nearly 75% sale ratio last year; this is extraordinary. Good sellers markets in the past might have hit 60%; but this still means 1/4 of all the homes on the market last year didn't sell . What were those homes and is there any chance you would have liked or wanted one of them? Even if, as was often the case last year, the market really was wholly in the Seller's favor, the up-front communication/consultation would have educated you on how you compete in such circumstances and given you options on how to win without going above your budget, having all cash to buy or taking unnecessary risks that could cost you way too much money in the long run. Communication is critical and needs to be cooperative and open. An Accredited Buyer's Representative, like myself, will show you how to win, if you will talk with us. My point is, when you're asking someone for information, you may find it more useful and beneficial to ask them for help or recognize that someone trying to understand something about you may truly be able to help you and much more so than by just giving you an answer to a question you thought was most important. Be open to having two way communication. If the agent you called isn't a good fit for you, spend some time to find one who is. We're out there and with 28 years of experience I can help you understand that real estate isn't just about you or me finding a home on line that interests you. There is so much more to buying that home than just finding it but you have to be open to talk with a competent, quality agent to learn what you don't know that might hurt or frustrate you. Don't be afraid of an agent with true knowledge and a desire to teach and help you. Search on-line; it's fascinating but when you want to buy a home, start with some quality communication with "Your" agent. As technology marches forward and the mantra of "there's an app for that" infiltrates more aspects of our lives, there are now headlines asking if agents can be replaced by algorithms. After 28 years in this business, I'd say for some agents, this is likely quite possible. Our industry has continued to do a terrible job of truly educating and training agents on what we need to know and how to present it. Information is all around us, as agents, home buyers and sellers. In the Seattle area it's estimated that 65%+ of licensed agents don't do this job as their full-time job. Nearly 80% of agents don't renew their license after two years. So when you see or hear that we have 5,000+ agents in our local marketplace, recognize that most of them aren't as informed as many home buyers and sellers. That doesn't mean you can't find the good ones; you just need to look and listen. Enter the Algorithm or the industry outsiders trying to replace the agent and earn some of the money in a home sale. However, what makes anyone think these non-industry participants or computer applications can truly help a home owner or buyer? These apps and outsiders have worked their way into our data system and now only want to "sell" you back to the agent willing to pay the most to talk to you, regardless of their competence or benefit to you. It's only a newer version of ignorance. Outsiders have been trying to capture revenue out of real estate sales for decades. To the outsiders it seems like a very simple business; someone wants to buy a home and someone wants to sell one. Match them up, make it happen and get paid. What all of these outsiders fail to recognize is the complexity of life issues involved in any given home sale. No two sales are ever truly the same because the life events of the participants are always different. Much, and in many cases most, of the work the agents do aren't truly related to finding or selling a house but in coordinating this process with the buyer or seller's life events and determining what our buyers and sellers truly want and need from us. I now see a new app that purports to help buyers find the best home for them by helping them compare neighborhoods, schools, commute times or other variables that a buyer can input into the app. Welcome to step one in a normal conversation between a quality real estate agent and a normal home buyer. How can an app do this if you, the buyer, aren't actually familiar with your home search area? Yes, you can study on line school rankings, find crime statistics, determine your commuting tolerance, look for homes in your price range that meet your feature requirements and then go take a trip to some of those homes. Or, you can have a real conversation with a quality agent and discuss what you hope to find and listen for suggestions on various areas that may meet your needs without having to do all the work yourself. You will also then have someone to advise you on smaller nuance issues like sidewalks, stores that may interest you, parks, walk-ability, changing trends and future appreciation potentials. The point is you don't have to do all this work on your own and have no one to point out aspects of your search that you may not have considered. This is a huge financial undertaking; why would you not want to have someone to express your concerns to and with to be sure you're truly finding the right home for yourself and/or family? So how do you find these quality agents? Sadly not with an app where agents, good or bad, can simply buy their way onto your computer or phone screen. Better options are to ask your friends and family for recommendations. Have a conversation with one or some of these people. Visit open houses in an area you think you might be interested in and see if you find any agents who have real data and information they will share with you. Ask these agents for additional references and see if you can find someone who is willing to teach you how real estate works. This is much less stressful and will save you more time than trying to learn an industry that has many more nuances and variables than it appears from the outside. You need a good advisor, not a better app to navigate the challenges of our market. What do rising interest rates really mean? Almost all of this year the "fear" reportings have been warning us of interest rates rising as though this is such a horrible event. The Fed was supposedly going to do this in March, then certainly by June; I'd thought they'd do it in September, as did much/most of the financial markets. When they didn't raise them in September, we saw the worst stock market performance of this year; the Fed didn't do what most everyone expected they would. It looked like they may put this off until January, so the stock market rebounded. Now the Fed has raised rates and stock market rallied, minorly but positively, as the Fed did what it seemed they had to; raise rates. The overall economy has improved and if you don't raise rates now, when would you? If the overall economy declines in the coming year, they then have some room to move back down or ease on rates to try to spur on new investments. So what happens now? Will rates continue a steady climb up? Will all interest rates rise? How does this affect me? It's possible interest rates could rise but most rates already rose this year, for almost all of 2015 and yet it's turned out to be one of the strongest years for home sales and appreciation locally and nationally in 9 years and one of the strongest overall for sales as a whole. So, rising interest rates aren't a killer of the real estate market or home values. In reality, real estate rates are set by the Fed at all but based on Bonds and Mortgage Backed Securities. While these don't operate in a vacuum, they aren't directly related, correlated or affected by the Fed. Often mortgage rates will move opposite of the Fed. The bonds and securities affecting mortgages are like all other investments, a factor of supply, demand and alternatives. It's possible interest rates will rise further in 2016 but not by any dramatic amount. In our local market, rates are hovering in the 4.125-4.25% rate. This might raise another .125-.25% in 2016 but what this means is your monthly mortgage payment might rise by $30-$60 per month, depending on the size of your mortgage and what rates you're comparing. While any rise is unwanted, it's not likely that $30-$60/month will change your ability to qualify or interest to buy or sell your home, if your true desire is to buy or move. Don't let the "fear reporters" run your life or your expectations. The market will continue to be strong in 2016 due to organic growth of population, strong employment and the returning buyers who've been sitting on the sidelines waiting for the credit, savings and employment to improve since the economic downturn of 2007-2011. It is not likely that the Fed will raise their rates much, if any further, in 2016 as the bulk of the world's economies aren't doing as well as the U.S. and as we raise the Fed rate, the U.S. Dollar increases in value and we make our goods more expensive to the rest of world, hurting our companies and putting downward pressure back on stock values, the Dollar and our interest rates. These variables are all operating on tiny margins of stability, so only tiny shifts can be made without upsetting the balance of many, seemingly unrelated aspects to our economy. The main point to recognize is that while I can no longer get you a 30 year fixed mortgage at 3.5-3.75%, I can still help you find a historically great rate, affordable to your needs and if you want the lower rates of 2014, we can find those in 7 year fixed mortgages, which might be as long as you may be in your next home anyway. If you plan to stay longer, then recognize the true nature of a low 4% interest rate and you'll see you're benefiting by the stronger economy, even if your monthly mortgage rises a little more than you hoped for.